If you’re facing the prospect of choosing a donor database system for your organization, drop by the Meeting Archives at TechSoup.org to check out this recent addition: Finding the Perfect Donor Database in an Imperfect World. There are nearly two hundred donor databases on the market. Each has its own strengths and weaknesses, fans and foes. The challenge is to find a system with strengths that meet your needs, weaknesses that won't get in your way, at a price you can afford. 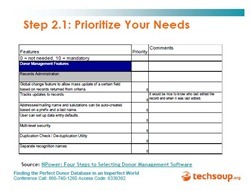 Robert Weiner, independent technology consultant at Robert L. Weiner Consulting, and Tracy Kronzak, Technology Manager at the Applied Research Center, walk you through selecting the right donor database system for your organization. Their presentation lays out a step-by-step plan to convene the right team, identify and prioritize your needs, secure funding, identify potential software vendors and test them against your needs, decide whether or not you need to issue a Request for Proposals, set up software demonstrations and hands-on tests that will let you compare “apples to apples,” and determine the real cost before you invest. Watch the recorded webinar online – or download the audio (MP3) and webinar slides to study on your own time. A companion article (PDF download) covers some of the same ground but adds useful detail in several areas, as well as separate sidebar sections on “Why Building Your Own Database Should Be Your Last Resort” and “Beyond the Basics: Some Database Functions to Consider” as you put together your software selection criteria.